The Rotary Club of Dartmouth was approached by the Dartmouth YMCA seeking sponsors for capital improvements they wished to do to their facilities. The Club's Board received a letter from the director of the YMCA outlining their need for new Diving/Starter Blocks for their pool. The Club considered this a very worthwhile project as it touched a large number of people in Dartmouth that use the YMCA facilities and because the YMCA provides a variety of programs matched to the needs of the community as well as their social commitment to assist less fortunate people/families have access to the facilities even if they cannot afford the membership fees or program costs. The Club donated $4000 which was sufficient to purchase the 4 new diving blocks. In return, the Club wished to have some form of recognition in the pool area for the contribution. 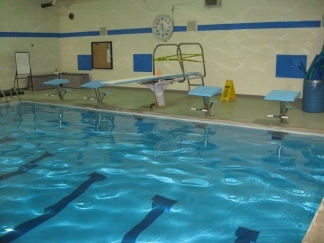 The YMCA was more than willing to install Rotary signage in the pool area quite visible from the viewing area. The project was completed in February 2010.